An amazing new photo of Saturn's north pole puts the planet's odd hexagon-shaped jet stream and dazzling rings on display. NASA's Cassini spacecraft exploring Saturn and its moons snapped the photo — which NASA released today (Feb. 3) — as the probe flew 1.6 million miles (2.5 million kilometers) above the ringed planet. "The hexagon is just a current of air, and weather features out there that share similarities to this are notoriously turbulent and unstable," Andrew Ingersoll, a Cassini imaging team member at the California Institute of Technology, said in a statement in 2013. "A hurricane on Earth typically lasts a week, but this has been here for decades — and who knows — maybe centuries." Saturn's hexagonal jet stream might be so long lasting because the planet is basically a giant ball of gas. Landmasses disrupt currents on Earth, but the storm remains stable on Saturn due to a lack of solid landforms, according to NASA. Cassini has been able to image the strange feature since 2009 when Saturn's northern hemisphere became illuminated by the sun during the planet's northern spring, NASA officials said. Scientists used 128 of Cassini's images to create an incredible video of the hexagon-shaped jet stream last year. Cassini isn't the first spacecraft to see Saturn's strange jet stream. NASA's Voyager mission first spotted the hexagon in the 1980s. The $3.2 billion Cassini mission launched toward Saturn in 1997. It arrived at the ringed wonder in 2004 and has been sending back incredible photos of the planet and its moons since then. The probe is currently on an extended mission, and is expected to collect data until at least 2017, at which point it will burn up in Saturn's atmosphere. 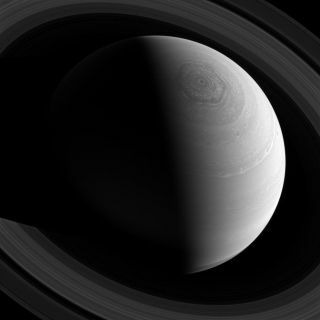 "As we approach Saturn's summer solstice in 2017, lighting conditions over its north pole will improve, and we are excited to track the changes that occur both inside and outside the hexagon boundary," Scott Edgington, Cassini deputy project scientist at NASA's Jet Propulsion Laboratory in Pasadena, Calif., said in a statement in 2013. Follow Miriam Kramer @mirikramer and Google+. Follow us @Spacedotcom, Facebook and Google+. Original article on Space.com.